It’s almost Fall! In theory that is…here in South Texas, we kind of just pretend to have a fall, but really it’s just a slightly cooler version of summer. We’ll take it though, any reprieve from the heat is welcome! We’ve been unusually busy during the past few weeks and the autumn equinox snuck up on me. I’m usually really good about putting seasonal books on hold at the library, but that didn’t happen for this change of seasons. We’re making it work with what we have and will be exploring the Harvest Moon this week as part of our nature study curriculum, Exploring Nature With Children. We have a few fall books we have and love including Fletcher and the Falling Leaves; Hello, Harvest Moon; Woody, Hazel & Little Pip; and The Autumn Equinox, and We Gather Together. I also wrote a short story to share at our nature-inspired co-op. 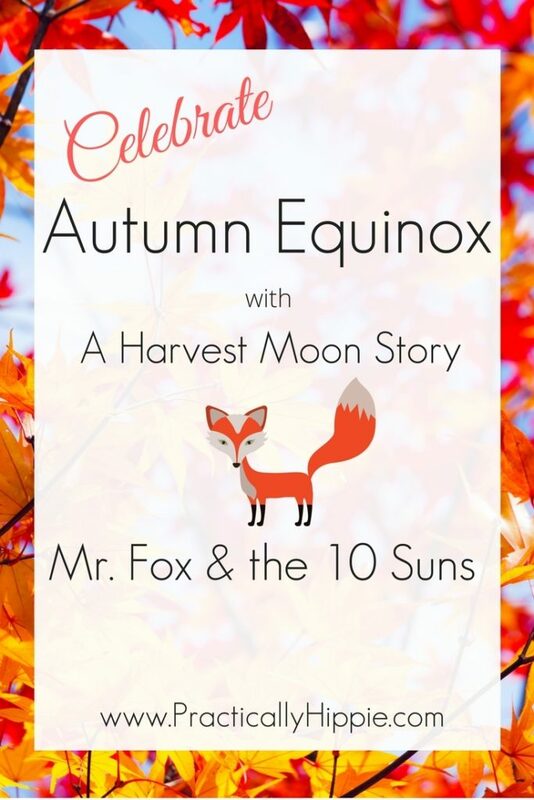 Mr. Fox & the 10 Suns is a gentle harvest moon story. It was inspired by the Chinese legend of Chang E, but adapted for my little ones (ages 3 and 6). NOTE: The closest full moon to the autumnal equinox is called the Harvest Moon. This year’s Harvest Moon is October 5. Plan a night nature walk to check it out! We love telling stories, especially about the changing of seasons. Storytelling is such an amazing tool to reach the hearts and minds of young children. If you’re new to storytelling, here’s how I prepare for a story. Read the story to yourself at least a few times. Read it out loud to yourself. Read it in front of a mirror to yourself. Read it until you know it by heart. Then gather your little ones, and tell them the story, from the heart. They won’t know if you miss a detail or mix up the plot a bit. Storytelling is an art, and you are the artist. Have fun with it! Get a PDF download of the story of Mr. Fox & The 10 Suns Here. Love this story? Pin it on Pinterest to have it for next year! Hi, I’d love to download your story but when I click HERE nothing happens…..???? I’m so sorry, something happened and it wasn’t working! I will email you a copy of the story right away, and all is fixed now!